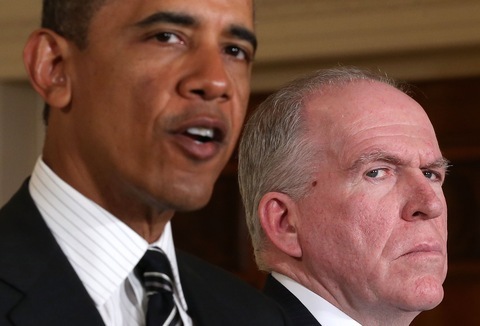 John Brennan, President Obama’s choice to head the CIA, is set to face the Senate Intelligence Committee. Photo by Alex Wong/Getty Images. Anyone who has ever learned to drive in the snow is familiar with the phrase “turn into the skid.” Well, the saying might also work for confirmation hearings. With the nomination of counterterrorism adviser John Brennan to head the CIA potentially in jeopardy, President Obama reversed course Wednesday, directing the Justice Department to provide members of the two congressional intelligence committees access to classified memos about targeted overseas killings of American citizens suspected of being terrorists. The move came as Brennan was set to appear Thursday afternoon before the Senate Intelligence Committee, with Democratic and Republican members expected to grill the nominee over the administration’s drone program, on top of other questions involving interrogation techniques and national security leaks. Sen. Ron Wyden, D-Ore., vowed Wednesday to “pull out all the stops” in order to obtain the document. But speaking Thursday morning on MSNBC, Wyden called Mr. Obama’s move “encouraging,” although he said lawmakers must still have “more robust” oversight of the administration’s intelligence portfolio, especially as it relates to drones. Senate Intelligence Committee Chairman Dianne Feinstein, D-Calif., released a statement Wednesday saying she was “pleased” with Mr. Obama’s decision to allow the panel access to the memo. “It is critical for the committee’s oversight function to fully understand the legal basis for all intelligence and counterterrorism operations,” Feinstein said. The administration is framing Wednesday’s decision as part of that effort. Rep. Mike Rogers, R-Mich, chair of the House Intelligence Committee, told NBC’s Andrea Mitchell on Wednesday that “there is oversight” from Congress over air strikes and targeted killings. “I knew about those operations, the targeting sets, all of that, leading up to it, including very shortly thereafter. And I review all of the air strikes that we use under this title of the law,” he said. The Washington Post’s Chris Cillizza notes that while the debate over the administration’s drone program rages on in Washington, the use of umanned vehicles to target terrorists has broad support among the American people. The Post’s Eric Wemple reports that the New York Times broke an informal arrangement and printed details of a U.S. drone base in Saudi Arabia, which Brennan started. Brennan should face slightly less scrutiny Thursday now that lawmakers have been given access to the drones memo, but there are still plenty of other matters for senators to examine. The National Journal has this preview of what to expect. The NewsHour will stream the Brennan hearing Thursday afternoon beginning at 2:30 p.m. ET. Find that here. Bloomberg’s Hans Nichols and John McCormick report that Mr. Obama is close to choosing Penny Pritzker as his next commerce secretary. Vice President Joe Biden choked up Wednesday as he pleaded with House Democrats to work on gun control measures. Sen. Robert Menendez, D-N.J., remains the subject of major news stories Thursday. The Washington Post looks at Menendez telling federal officials that his friend and donor had overbilled the government by $8.9 million for care at his clinic, and National Journal reports on how much of a toll the senator’s reimbursements to that donor for flights to the Dominican Republic cut into his personal wealth. Politico’s Jake Sherman finds some Republicans wanting to cut a sequester deal. Rep. Paul Broun, R-Ga., will run for retiring Sen. Saxby Chambliss’ seat in 2014. Roll Call’s Joshua Miller takes a close look at the state’s sure-to-be-intense GOP primary. The Republican State Leadership Committee (RSLC) took a step toward diversifying its party from the ground up Wednesday, announcing the formation of the Future Majority Caucus. The effort, chaired by New Mexico Gov. Susana Martinez and Nevada Gov. Brian Sandoval, will recruit and advise minority and female state legislature candidates for the 2014 cycle. “We as a party have to do better. It’s not just in the GOP’s interest; We have to make clear it’s in the interest of minority and women voters,” said former Mitt Romney campaign senior adviser and current RSLC chair Ed Gillespie. Former Sen. Scott Brown, R-Mass., joined the corporate board of Kadant, a Westford, Mass., paper company. The Boston Globe reports that he is telling people he will be appearing regularly on Fox News, though negotiations are still ongoing. American Crossroads has made a $10,000 digital ad buy attacking actress Ashley Judd, who is rumored to be eyeing a challenge to Senate Minority Leader Mitch McConnell, R-Ky., in 2014. Slate examines former Treasurey Secretary Tim Geithner’s new gig, and also be sure not to miss #geithnerbooktitles. The Hill rounds up the jokes Wednesday night at the Washington Press Club Foundation’s 69th annual Congressional Dinner. The organization funds internships and works to boost women and minorities in newsrooms. Christina is co-chairman of the dinner committee. Thursday’s tidbit from NewsHour partner Face the Facts USA breaks down improper government payments, which cost the country a lot of dough. The NewsHour’s Gwen Ifill examined Mr. Obama’s selection of REI’s Sally Jewell as the new interior secretary with National Journal’s Coral Davenport, Greg Ip of The Economist and Julie Rovner from NPR. Watch here or below. We also explored the the U.S. Postal Service’s decision to cancel mail service on Saturdays, a move that came after the USPS lost a record $16 billion last year. Packages will continue to be delivered and post offices will remain open, but letters will no longer be sent to houses or businesses. This move will save an estimated $2 billion. Critics from Congress and the American Postal Workers Union were quick to respond Wednesday. They argued that small businesses, rural areas and disabled persons who depend on Saturday mail service will suffer. Congress has the power to overrule the agency on the decision. Postmaster General Patrick Donahoe joined Jeffrey Brown to discuss the decision and its criticism. He argued the agency has no choice at the moment. He admitted the impact on citizens remains uncertain, but emphasized essential mail such as medicine will still be delivered. “We think the future is very bright, as long as you take the steps to get the finances in order,” he said. For Science Wednesday, Jenny Marder looked at the link between air pollution and a cockroach-related asthma. Thanks for making PBS the most trusted news source in a new survey from Public Policy Polling. If CBS ever has ‘switch jobs for a day,” I’d go for @drewfromtv‘s job. Katelyn Polantz and desk assistants Simone Pathe and Sarah McHaney contributed to this report.